What does sustainable investments, ESGs, SDGs and impact investments mean? Sustainable investing is an approach to investment where environmental, social or governance (ESG) factors, in combination with financial considerations, guide the selection and management of investments. Sustainable investing is the umbrella term that incorporates social responsible investing, SRI, impact investing and it encompasses the different strategies/activities. According to GSIA, global SRI assets in early 2016 reached $22.89 trillion, a growth of 25% compared to 2014. The strategies and activities under sustainable investments are shown below. 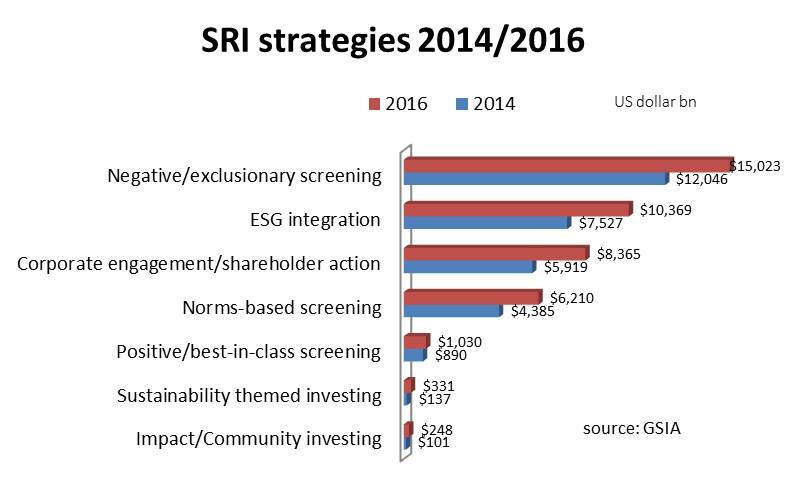 THe top 3 strategies; negative and exclusionary screening (15 tn), ESG integration (10.3 tn) and corporate engagement/shareholder action (8.3 tn) are very large established strategies while impact/community investment (248 bn) and sustainability themed investing (331 bn) are growing fast but still very small. ESG (Environmental, social and governance) refers to sustainable investment criteria used alongside traditional financial criteria in managing and selecting investments. ESG is a criterion, the word is also used as ESG factors, ESG metrics and ESG integration, which is one of the largest strategies within sustainable investments. The use of ESG by institutional investors has been rising over the past 15 years as a result of increasing evidence that integrating ESG factors in the investment process can actually improve the risk/reward of investment portfolios. Impact investment is an approach to investments and is a fast growing but the smallest subset and strategy within sustainable investments. The differentiator of this approach is the intentionality to generate positive social and environmental impact and the commitment to measure it. In terms of market size there are two benchmarks: 1) GIIN’s $144bn based on their annual survey of assets aggregated by their respondents in 2017, and 2) GSIA 2016 Review which shows the assets of the category Impact and Community investments at $248bn. The SDGs, a set of 17 goals was adopted in Sept 2015 by the UN “to end poverty, protect the planet and ensure prosperity for all “. The goals have specific targets to be achieved by 2030. The development of indicators and monitoring framework for the SDGs which followed has attracted many investors and asset managers to commit to invest in these goals. The SDGs are now being adopted as a framework in many of the sustainable investment strategies including impact investment funds. This entry was posted in concept, impact investments, SDGs, sustainability, sustainable investments on May 21, 2018 by microfinance.